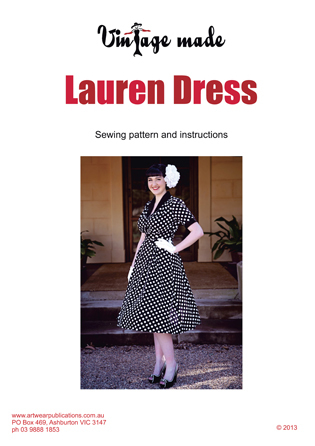 The Lauren Dress Pattern was the pull-out pattern in the now sold-out second issue of Vintage Made Magazine. The Lauren Dress is sized according to your bust measurement. We have chosen to increase the sizes in 5cm (2″) increments, and display the sizing in inches, as true vintage patterns always featured their measurements in inches. Notions: 45cm (18″) zip; 50cm (20″) of good quality, medium-weight iron-on interfacing for front facings; lightweight shoulder pads (optional); 3 x vintage-style or self-covered buttons approx 2cm (1″) in width; pins; tailors chalk; thread. Suitable Fabrics: 3.5m (3.85yds) of 110cm (43″) wide medium to lightweight fabric such as Pique, Linen, Linen/Silk blends, Cottons or Broadcloth for the first three sizes (add an extra 50cm per size for the last two sizes). No obvious diagonals. Allow extra fabric to match stripes or plaids. If using a contrast fabric you will need 50-70cm (20-27.5″) of the contrast. If using 140cm (55″) wide fabric you will only need 3m (3.3yds) for the first three sizes (add an extra 50cm per size for the last two sizes to allow for altering the layout of the skirt patterns).